Курс сольфеджио.Диатоника. Учебное пособие. 5-е изд., стер. Solfeggio is one of the most important disciplines of the music education along with the elementary music theory, harmony, polyphony, analysis of music pieces. Artyom Petrovich Agazhanov (1913–1989) was a music expert, a teacher of music-theoretical disciplines, a professor of Moscow music conservatory. The textbook is the first from three parts of solfeggio course for the students of music colleges. The book offers 47 lessons for learning the intoning of major and minor scales up to three key signatures. The addition includes the patterns for prima vista accompanied by the piano and the schemes of harmonic dictations. The textbook is meant for three years of studying. 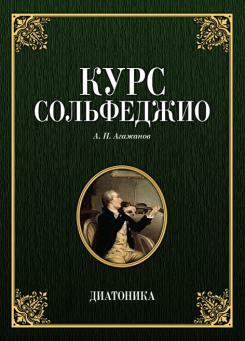 The textbook is the second from three parts of solfeggio course for the students of music colleges. It is intended for the students of music colleges, faculties of folk instruments, brass and vocal faculties and can also be used by the students of other specialties.